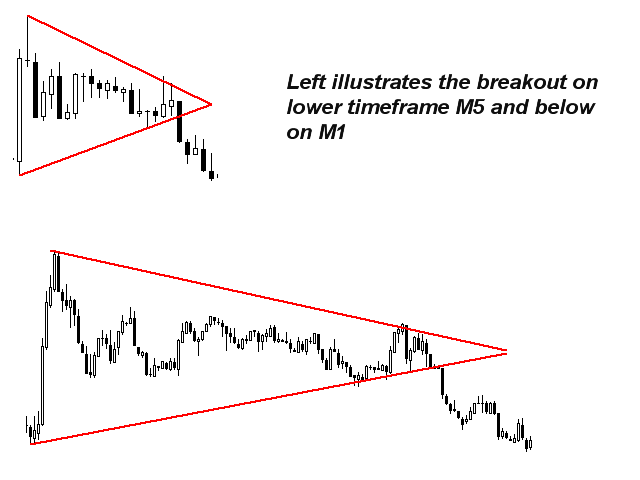 This indicator identifies high-probability breakout patterns. It does this by identifying strong, symmetrical pennants and triangles. This pattern DOES NOT appear very often on higher timeframes. But when it does, it is a very high-probability setup. The indicator also includes an Inside bars scanner. It can for example be used to detect a special type of Inside bars formation which is formed by a Master candle (MC) followed by 4 inside candles (please see the strategy explanation below). 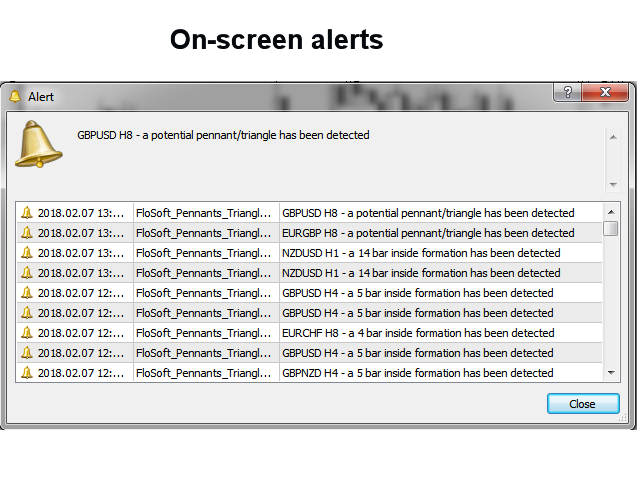 Monitors every timeframe, from M1 to MN, and sends you a real-time alert when a pennant, triangle or inside bar formation is identified. The indicator includes an interactive panel. Please see separate screenshot. 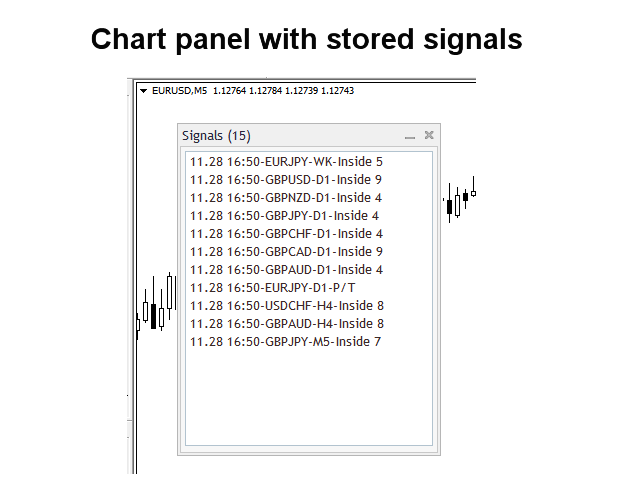 Please note that due to the multifunctionality neither buy/sell advice nor lines and arrows will be drawn on the chart. Panel width: Default is 200. For instance, if you are using a non-standard font size in windows, you could set this to a larger value in order for the whole text to be visible. Template name: The template you put here will be applied to the chart which will be opened when you click on a signal in the panel. The name must include the file extension (.tpl). Line color: The color of the formation lines which are drawn on the chart which has been opened from the panel. Enable scanning: True or False. Enables scanning of Pennants and Triangles. Enable scanning: True or False. Enables scanning of inside bars. Minimum amount of inside bars: Default is 6 (4 for the MC strategy). Maximum amount of inside bars: Default is 20 (5 for the MC strategy). Min. master candle size in points (0=any size): Only a MC larger than or equal to this size will give an alert. Default is 0. Max. master candle size in points (0=any size): Only a MC smaller than or equal to this size will give an alert. Default is 0. 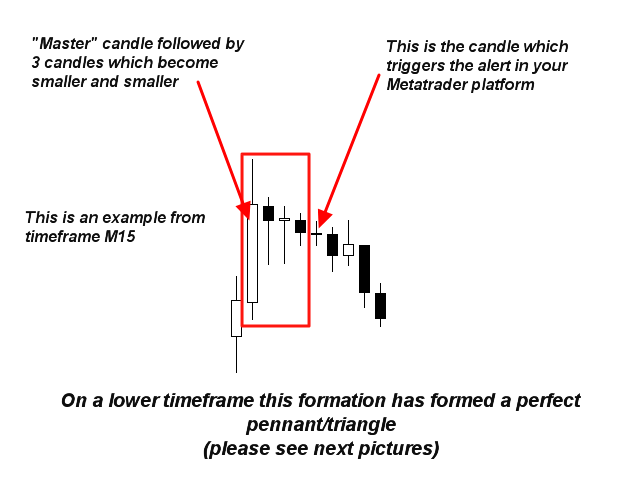 Master Candle (MC) is a trading strategy based on a candle formation where the first (master) candle is followed by 4 smaller candles which are inside the first candle. The whole formation is built of 5 candles, independent of if bearish or bullish. Timeframes: H1 and H4 charts. Even if the MC strategy works best on H1 it can be traded on all timeframe and currency pairs. Mainly on H4, H1 and M30 charts. Currency pairs: Trades best on volatile pairs such as GBPUSD and GBPJPY. After breaking MC high/low a position will be taken in the direction of the break. It is recommended that the MC has a size of 40 to 100 pips (but it depends on the volatility of the currency pair in question). It is also recommended to put stop orders for instance 5 pips above and below the MC high/low. Some traders also use the rule that a break in any direction should occur during the next 3 candles after the MC creation (5th candle). Anyway, it is highly recommended to cancel any stop order if there is no break after 24 hours. Finally it is for better results recommended to trade in the direction of the trend as well as to avoid trading at strong and important price levels - resistances and supports. It is also advisable not to trade MC which appears inside another MC.